The worst thing about Opening Day is that everything is exaggerated. A good game makes people think that the entire season is going to be wonderful. And bad game makes people fear the worst. Friday’s season opener in Arizona was a mixed bag for the Giants, and in particular, Tim Lincecum. The Diamondbacks jumped on Lincecum for two homers and three runs in the first inning. But then the Freak settled in to strike out five over the next four scoreless innings. But a leadoff double by Justin Upton set the stage for the decisive sixth inning, which turned on an error by Buster Posey. After Miguel Montero’s loud fly out to right sent Upton to third and Paul Goldschmidt walked, Jason Kubel had a swinging bunt in front of the plate. Posey went to pounce the bouncer but failed to field it cleanly, and Kubel was able to beat the throw to first. Ryan Roberts followed a two-run double into the left-field corner that proved to be the game-winner. If Posey fields Kubel’s nubber, it could have changed how Lincecum approaches Roberts with two outs and first base open. Instead, the Giants were two down heading into the ninth and could only manage one run off closer JJ Putz on Pablo Sandoval’s two-out double. Trying to put a good spin on a loss, the Giants did manage 11 hits and 4 runs. In the game, they hit .297 as a team. But a few hits were good-luck knocks. Aubrey Huff was off-balance when he reached across the plate and pulled a soft looper into right field for a single. Pablo Sandoval turned an emergency hack into an infield single to third. And Ryan Theriot got an infield single off the glove of pitcher Ian Kennedy. Still there were good efforts. Melky Cabrera was 2 for 5 with a two-run laser home run in the sixth. Buster Posey was 2 for 4 with a walk. Ah yes, the walk. The Giants only managed two in the game. Posey’s first-inning walk when Kennedy clearly decided to go after Huff with Cabrera on second and two out. Huff acquiesced by flying out to center. The other walk was to Lincecum in the second, and Angel Pagan responded by swinging at THE FIRST PITCH from Kennedy and popping to short. The bullpen was solid. Guillermo Mota, Jeremy Affledt and Clay Hensley gave up just one hit and one walk in 2 2/3 scoreless innings. Madison Bumgarner takes the mound against Daniel Hudson in a 1 p.m. game Saturday that will be televised live on Fox. It’s prediction time for MoreSplashHits. But first, a history lesson. MoreSplashHits has predicted the Giants’ final record each of the past four seasons. And here they are, with the results. The Giants exceeded our predictions in every year but 2011, when coming off a World Series victory filled us with a bit of optimism. And the Giants could have reached 94 wins in 2011, if Buster Posey didn’t miss four months, if Freddy Sanchez didn’t miss almost four months, if Pablo Sandoval didn’t miss six weeks; if Brandon Belt, Miguel Tejada, Pat Burrell, Andres Torres and Aubrey Huff weren’t so gawd-awful. So when you compare the 2011 opening lineup and the 2012 opening lineup, there aren’t many changes. That would not give you reason for optimism. But MoreSplashHits is going off the premise that the 2012 offense CAN’T be as bad as in 2011. It CAN’T. Belt HAS to be better. Huff HAS to be better. Crawford, Cabrera and Pagan HAVE to produce more than Tejada, Burrell and Torres. Posey and Sandoval HAVE to be healthier. These aren’t lofty goals. The bar was set so low in 2011 that exceeding those expectations should not be difficult. Plus, the Giants’ 2012 bench is deeper. Nate Schierholtz was slated as a starting in RF in the offseason. Now, he provides solid depth. Gregor Blanco brings speed and defense that was sorely missing from the 2011 lineup. We like what Brett Pill could bring to the plate, and Hector Sanchez brings a ton of promise. We’re not all that excited with Ryan Theriot, so we’ll set the bar low there. But you add it all up, along with stellar pitching that returns, and THAT does give us optimism for 2012. While San Francisco Giants had to wait for opening day, the Fresno Grizzlies opened the Triple-A season with a 3-0 win at Tucson. The spotlight was on Fresno starting pitcher Ryan Vogelsong, who was making the first of two rehab starts as he opens the season on the DL. Vogelsong threw four shutout innings, giving up three hits, three walks and striking out six. He threw 83 pitches, 49 for strikes. Vogelsong will make his second Triple-A start on Tuesday at Las Vegas before making his Giants debut on April 15. Heath Hembree, the Giants’ closer-of-the-future, earned his first save with Fresno, giving up two hits and striking out two in a scoreless ninth. The Giants don’t play on opening day. But everyone’s got a prediction. So here’s a sampling of what some major newspapers are saying about the Giants’ chances this season in the NL West. The Morning News also is picking the Giants to win the West, followed by the Diamondbacks, Rockies, Dodgers and Padres. TO MINORS: IF Joaquin Arias, C Eli Whiteside, P Steve Edlefsen, P Jean Machi. There was a lot to be happy about after Tuesday’s exhibition at the Oakland Coliseum, so we’ll leave the downer news for later in this post. The Giants won, taking their second straight against the cross-bay rivals, so that’s good. Matt Cain had a solid outing in his first outing since agreeing to a five-year contract extension on Monday. Cain appeared ready for the season, limiting the A’s to two runs on five hits and one walk over five innings. He struck out six. Cain was also helped out by a nice throw from center fielder Angel Pagan, who threw out Oakland’s Yoenis Cespedes trying to score from second. And Cain capped his night with a nifty, yet somewhat unnerving, throw out of Coco Crisp. Crisp squibbed a Cain pitch to the right of the mound. Cain charged to field it, but slipped on the grass. Still, he was able to throw Crisp out at first with a throw from the seat of his pants. After Cain left, the bullpen again kept Oakland bats quiet with four hitless innings from Clay Hensley, Jeremy Affeldt, Guillermo Mota and Sergio Romo. OK, now the downer stuff. For the second night in a row, the Giants still struggled to mount much offense against a pitcher who is battling to be Oakland’s No. 5 starter. It was nice to see the Giants use a little small ball to score in the first inning. 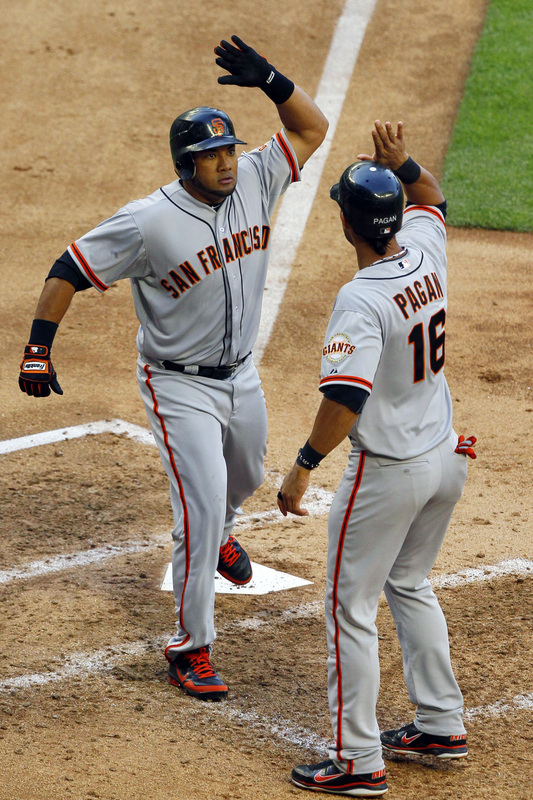 Gregor Blanco led off the game with a single, stole second and scored on Pablo Sandoval’s one-out single. Yet, after the Giants took a 3-2 lead in the fifth, they had the bases loaded and one out but failed to score when Emmanuel Burriss and Eli Whiteside both failed to put the ball in play. Oh well. It is still preseason, so even if they pounded the ball all over the year, it wouldn’t mean anything. In an interview with CSN’s Amy Gutierrez, Aubrey Huff quipped that “now that I’m an outfielder” he could give tips to the other outfielders. It was just a bit of Huff-like whimsy, but it seemed to indicate that Brandon Belt has made the club. Manager Bruce Bochy said all roster decisions have been reached, but he would not announce them until Wednesday morning prior to the Giants final preseason game. Bochy said he got good reports from Barry Zito’s bullpen session Monday in Arizona (he didn’t give up any runs; of course, he didn’t face any batters either). Zito will pitch a minor-league game Wednesday before joining the team in Phoenix for Friday’s opener. Sigh, I guess that means they are going to stick with him to pitch Monday in Colorado. Bochy also said that Hector Sanchez has done enough to make the squad, but whether he does or not depends on how many catchers the Giants keep. “It’s a matter of two or three,” Bochy said. Gee, thanks for clearing that up, Boch. We were thinking it could be one or four. Yusmeiro Petit will get the start as the Giants face the A’s at 12:45 p.m. Wednesday at AT&T Park. The deadline to submit opening 25-man rosters is 2 p.m. PDT Wednesday. As the Giants have at 12:30 p.m. game against the A’s at AT&T Park, manager Bruce Bochy said he’ll announce his final decisions Wednesday morning. This is not a prediction. Bochy has stated, and re-stated, that he intends to open the season with 12 pitchers, even though the team will go with a four-man rotation until Ryan Vogelsong comes off the DL on April 15. That means one fewer spot for position players. And we think that means Sanchez will go to Fresno. We like Whiteside over Chris Stewart. Stewart is the better defender, which is what you look for in a backup catcher. But with the limitations that will be placed on Buster Posey, the Giants need a backup catcher who can hit. Whiteside has shown better ability to do that than Stewart. Now, onto Zito. We have zero confidence that two bullpen sessions and a minor-league start in Arizona is going to change Zito from a batting practice pitcher that we saw in his last two starts into Arizona into a serviceable starter for the Giants. So, if we were running things, we’d find some kind of reason to put Zito on the DL to open the season. Then we’d start Yusmeiro Petit in Colorado on April 9. It’s not a great option with Vogelsong and Eric Surkamp on the DL, but it’s the best one available.